Welcome back! This month we explore a historical aspect of Kanchanaburi that is way off the usual tourist circuit. Join us on this journey as we trace the events that led to a major archaeological discovery in this province and present the findings to you. Think of Kanchanaburi and the infamous Death Railway during World War II immediately comes to mind. The history of Kanchanaburi goes further back than the 1940s. Even the Khmer sanctuary Prasart Mueang Sing built in the reign of King Jayavarman in the 13th C isn’t far back enough! The history of Kanchanaburi dates back to the Neolithic¹ period, the last phase of the Stone Age or New Stone Age more than 4,000 years ago! Neolithic Man lived in the area with his stone tools, living off the land by gathering from forests, hunting and later agriculture. Ironically it was events during World War II that brought to light the archaeological treasures in Kanchanaburi. In 1943, Dr H R van Heekeren, a Dutch archaeologist, was a prisoner of war in Kanchanaburi involved in the construction of the Death Railway. In the course of his daily life, he found several odd-shaped stones in the Ban Kao area. His archaeological background told him that these stones looked like primitives tools and one even looked like an axe head. The excavation team found many ancient artefacts on the banks of the Khwae Noi River near the Ban Kao Railway station. Through a process of radio carbon testing, the age was estimated at 4,000 years! What’s more, some of these artefacts were found to be similar to those from the Lung Shan or late Neolithic culture in China! 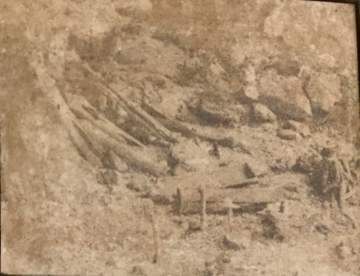 In the subsequent years, the Faculty of Archaeology in Silapakorn University and the Fine Arts Departments excavated several sites in the other districts in Kanchanaburi namely Bo Phloi, Phanom Thuan, Sai Yok, Si Sawat Tha Maka. In 1985 an even more interesting discovery was made in the 13th C Prasart Mueang Sing, a Khmer sanctuary in Amphur Sai Yok. In the following year, an excavation by the Fine Arts Department uncovered a burial site with prehistoric remains! In some of the districts, I’m unable to locate the exact site so only the district is mentioned. 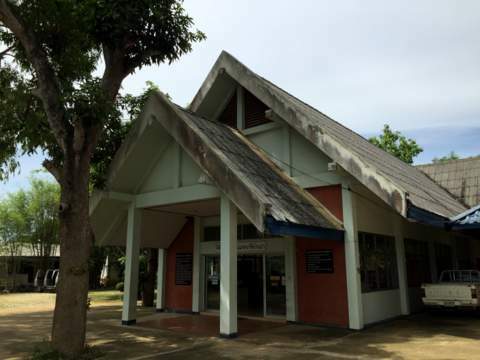 As a result of these discoveries, the Ban Kao National Museum was established in 1965 to preserve and display all the prehistoric artefacts discovered in Ban Kao and other parts of Kanchanaburi. The museum is housed in a single story wooden U-shaped building. Displays of these archaeological discoveries are organised into six rooms. Let’s take a virtual of this museum. The first room in the Ban Kao National Museum covers the geography of Kanchanaburi. Mountain ranges cover the northern and western sectors of Kanchanaburi; the Thanon Thongchai range to the north and Tanaosi range to the west. These mountain ranges are the source of the three main rivers; the Khwae² Yai, Khwae Noi and Ta Phoen. The Khwae Noi and the Ta Pheon River join the Khwae Yai to form the Mae Khlong River that flows through Rathchaburi and Samut Songkhram into the Gulf of Thailand. Most of the archaeological discoveries were made in the Khwae Yai and Khwae Noi river valleys and the numerous limestone caves in the mountains between these two rivers. Ban Kao where the first discoveries were made, lies between the Khwae Noi and Khwae Yai. The name of the river should be correctly be spelt "khwae" (meaning tributary and pronounced ku-where) and not "kwai" (meaning buffalo and pronounced ku-why) as it’s popularly known. Khwae Yai means big tributary and Khwae Noi, small tributary. The Thung Yai – Huai Kha Khaeng Wildlife Sanctuaries, a UNESCO World Heritage site, consists of the Thung Yai Naresuan Wildlife Sanctuary in Tak in the north, the Huai Kha Khaeng Wildlife Sanctuary in Uthai Thani and upper Khwae Yai in Kanchanaburi. The area is about 200 km from north to south and 622,200 hectares making it the largest conservation area in mainland South-east Asia. 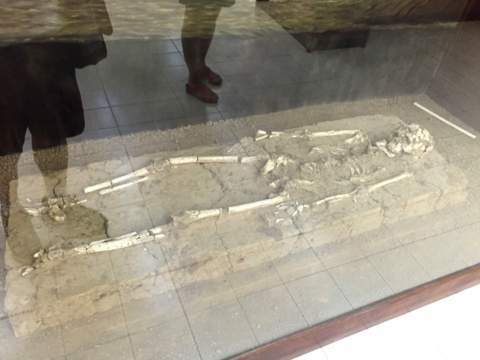 The excavation in the Ban Kao area found 44 human skeletons; males, females all below 30 years of age and infants. 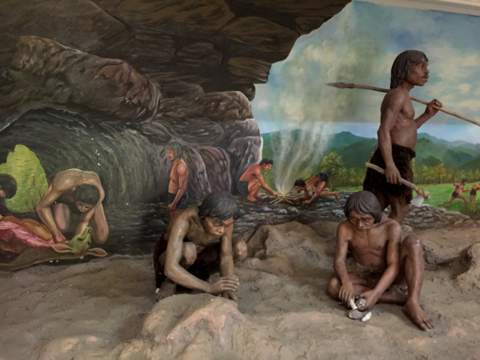 The findings are displayed in this room along with pottery particularly clay containers on tripods, stone tools, ornaments like beads and bracelets and spears made from animal bones. It was the custom then to bury the dead with animals, clay pots, ornaments and stone tools. 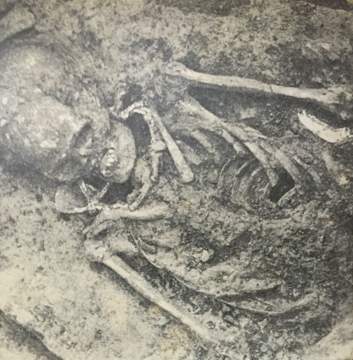 Remains of pigs, dogs have been found buried with the human skeletons. The articles buried with the dead person are an indication of the status of the person. 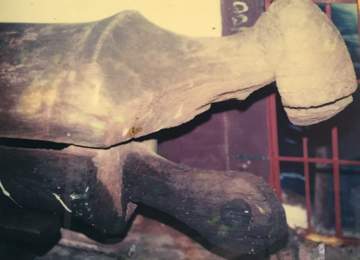 Various types of pottery were used for burials like this tripod vessel found in Ban Kao which is similar to the Lung Shan pottery of the Neolithic period found in China. From 1977 – 1979 excavation of the caves in Khao Thalu, a mountain near Ban Kao revealed artefacts of the Hoabinhian period. 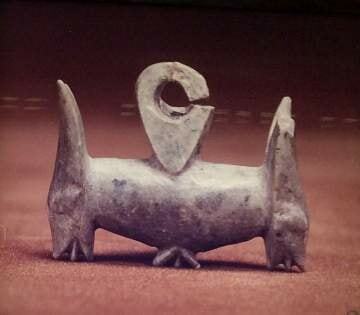 The term Hoabinhian is derived from the province Hoa Binh in Vietnam where such artefacts were first discovered. This term was used by French archaeologist Madeline Colani to describe the Mesolithic cultures (Middle Stone Age) in Southern China, Vietnam and Thailand whose remains were found in rock shelters and caves. This room displays coffins used during that period. 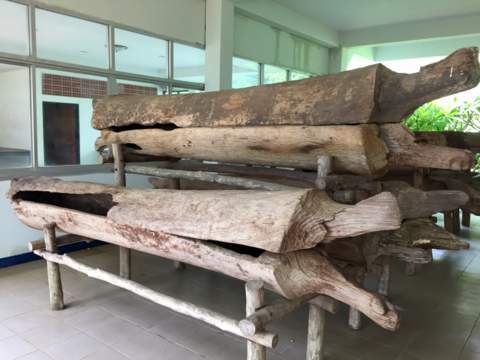 These wooden coffins were found during the first excavation from 1960 – 1961 on the banks of the Khwae Noi and Khwae Yai in Sai Yok district and also in Thong Pha Phum and Sri Sawat districts in the mountains to the north-west. The coffins were made from hollowing out tree trunks 2 – 3 m long with both ends shaped like human or animal heads. 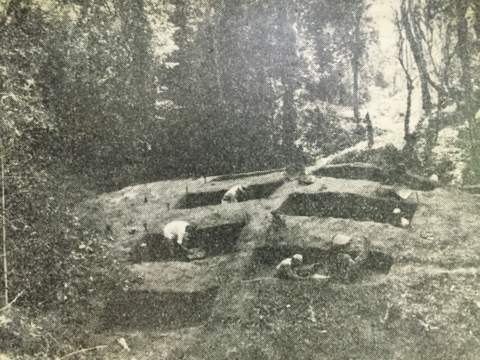 Such coffins have also been found in Mae Hong Son in northern Thailand. This room displays more stone tools or pieces of them, clay containers, ornaments like beads. 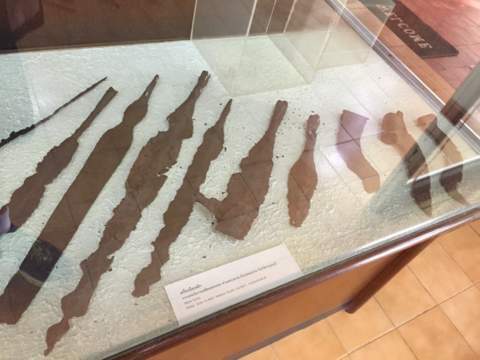 These artefacts were found in caves in various districts like Bo Phloi, Phanom Thuan, Sai Yok, Si Sawat and in the city district of Kanchanaburi. 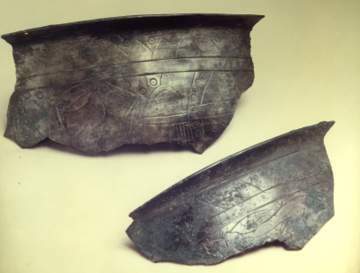 Bronze ornaments, bronze containers and iron tools have also been discovered indicating the end of the Neolithic period when metals tools were introduced, first copper and later bronze. The art of prehistoric society is displayed here. 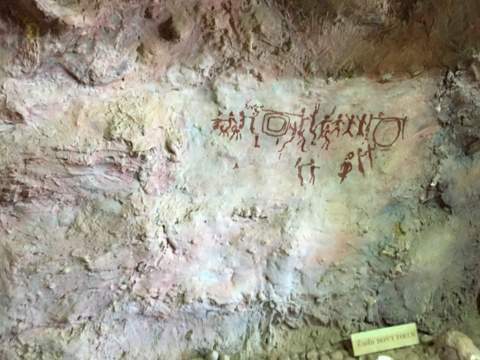 These consist of rock paintings in red of human figures, animals and objects. It is believed that these paintings depict rituals. 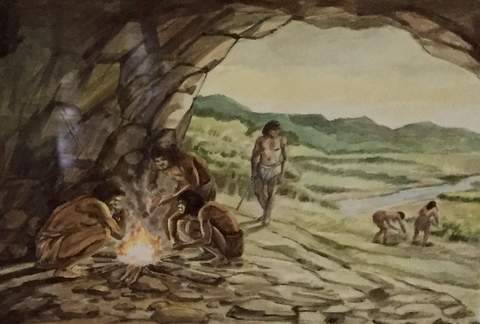 In addition there are oil paintings showing the development of Neolithic Man, first living off the land by gathering from the forests, hunting and later farming in settlements. There are photos of beads, ornaments and decorations on display from Phanom Thuan and Tha Maka districts. The originals however are displayed in the National Museum, Sanam Luang, Bangkok. Linling-o refers to a style of earrings made from precious stone or metal popular in the late Neolithic and early Bronze Age. Found in the Philippines, Vietnam and Thailand. 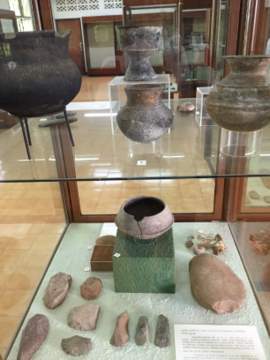 The last room in the Ban Kao National Museum displays photos of artefacts and relics from Prasart Mueang Sing including clay and bronze pottery. Though this Khmer sanctuary was built in the 13th C during the reign of King Jayavarman II, a prehistoric burial site was uncovered in 1986! We will be covering Prasart Mueang Sing in detail next month. 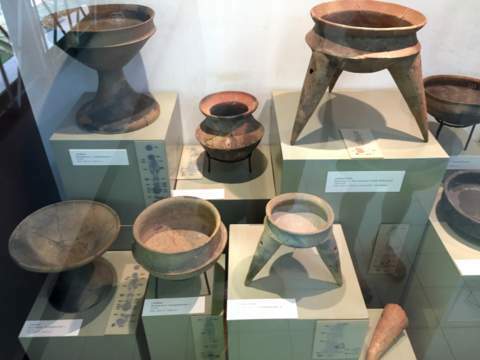 The archaeological displays in the Ban Kao National Museum top the list of historical treasures in Kanchanaburi. There’s more to come and we will be exploring the rest of these treasures in our subsequent visits. We would like to thank the staff of the Ban Kao National Museum for their assistance and information provided during our visit. All photos are with the courtesy of the museum. From Bangkok get on to Boromarajajonani Road or Phet Kasem Road depending on which is more convenient for you. You will eventually get on to highway 4, Phet Kasem Road and hit Ban Pong, Ratchaburi. Continue on to highway 323 till you get to Kanchanaburi city. Drive through the city along Saeng Chuto Road. After you have left the city, turn left to re-join highway 323. Continue on highway 323 you get to a major intersection. Turn left to highway 3229. Continue on highway 3229 till you get to the Ban Kao intersection. Turn right at the Ban Kao intersection and continue on for about two km till you reach the turning on the left to the Ban Kao National Museum. There’s a discrepancy between the numbering of the roads around Kanchanaburi city. In the Kanchanaburi city road signs and Google map, Saeng Chuto Road which passes through the city is numbered 323 and the road bypassing the city is numbered 367. In the Thai highway map published by Thinknet 2014 edition, the road through the city is simply Saeng Chuto Road and the bypass road highway 323.This is in correct! Both roads eventually join up at the north-western edge of the city and continue onto highway 323. The Ban Kao National Museum is open from Wednesday – Sunday from 0900 – 1600 hours. It’s closed on Mondays, Tuesdays and national holidays.